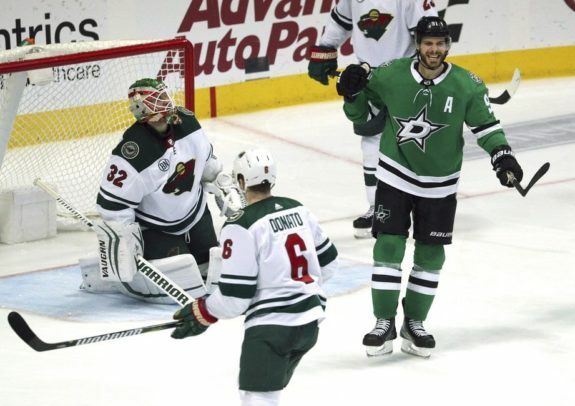 DALLAS — Tyler Seguin broke open a scoreless game with two third-period goals, and the Dallas Stars beat the Minnesota Wild 3-0 to take the Western Conference’s top wild-card spot Saturday night. Ben Bishop made 22 saves for his career-high seventh shutout of the season, and Tyler Pitlick also scored for the Stars. Dallas will open the post-season against Nashville. Seguin scored the first goal on the power play with 17:16 to play. He took a pass from Alexander Radulov high in the left faceoff circle and sent a slap shot over Minnesota’s Alex Stalock and into the upper-left corner of the net. The Wild had stopped 22 straight power plays over nine games. For the second goal, Seguin’s team-high 33rd of the season, he took the rebound of a shot by Jamie Oleksiak in front and backhanded the puck past Stalock six minutes later. Pitlick scored off another rebound with 7:59 remaining. Bishop recorded the 31st shutout of his career. He finished the season with career bests in save percentage (a league-leading .934) and goals against average (1.98). Stalock was far busier, stopping 41 shots. Dallas came up empty during a scoreless first period despite a 14-7 advantage in shots on goal. Each team had one unsuccessful power play. The Stars also led in shots with the man advantage, 4-0. In the scoreless second period, Dallas had an even bigger advantage in shots at 20-5, but only the Wild put the puck in the net. Stars coach Jim Montgomery challenged Greg Pateryn’s slap shot from the blue line that went past Bishop 18 seconds before intermission. The video review showed that Minnesota was offside on that possession. Stalock turned away good chances by Jamie Benn and Alexander Radulov, a 2-on-1 break by Seguin and Andrew Cogliano and a flurry of shots with two minutes left in the period. Bishop stopped a close-range shot by Kevin Fiala during the final minute. Wild defenceman Nick Seeler and Dallas centre Radek Faksa energized the second period with two scuffles. They were penalized for roughing at 7:05. After leaving the penalty box, they went back right back in for fighting at 9:11. NOTES: Fiala had the unusual distinction of playing in 83 games this season – 64 for Nashville, with another 19 after being traded to the Wild. Playing in all 82 games were Minnesota’s Marcus Foligno, Ryan Suter, Jonas Brodin and Jared Spurgeon, and the Stars’ Miro Heiskanen, Esa Lindell and Tyler Seguin. Marcus Pettersson played in 83 contests for Anaheim and Pittsburgh. … Minnesota LW Zach Parise (illness) missed the season’s final two games. … Dallas successfully killed 15 of 16 penalties in the final six games. Wild: Can look forward to June 21, the first day of the NHL Entry Draft in Vancouver. Stars: Begin the Stanley Cup playoffs at Nashville. Dallas was 2-0-1 on the Predators’ home ice this season.